Removing all doubt that the California Agricultural Labor Relations Boardis a Marxist tool for unionization, William B. Gould IV, Gov.Jerry Brown’s appointed Chairman of the board, announced his resignation Friday, in a cranky letter complaining that farm workers don’t want to join the United Farmworkers Union. Today, Arciniega is one of the ALRB’s top staff attorneys. And with the recent shakeups in the ALRB general counsel’s office that resulted in the sackings and sudden resignations of top lawyers, people are wondering why Arciniega remains on the job. State law requires all ALRB personnel to be worker advocates with no partiality for or against either employers or unions. Arciniega is anything but objective. Her title at the UFW was “lead organizer.” The Militant, published by the Socialist Workers Party, reports Arciniega being a UFW boycott leader as far back as 2000. While California Gov. Jerry Brown has ignored thousands of California farm workers who don’t want to be unionized,Wisconsin became the 25th Right-to-Work state. Happy Labor Day Gerawan farm workers. In one of the most significant labor relations fights in the country, proceedings have turned ugly, with many questioning the legal tactics and scruples of the Agricultural Labor Relations Board. TheAgricultural Labor Relations Boardsays it exists to protect the rights ofallagricultural employees, including those not wanting labor organization representation, as is the case with Gerawan Farming employees. However, Gerawan farming employees say they have not received any assistance from the ALRB. Plenty of Evidence of Injustice to Farm Workers By California Govt. Posted by Katy Grimes at 10:41 pm on Aug 24, 2015 Comments Off on Plenty of Evidence of Injustice to Farm Workers By California Govt. 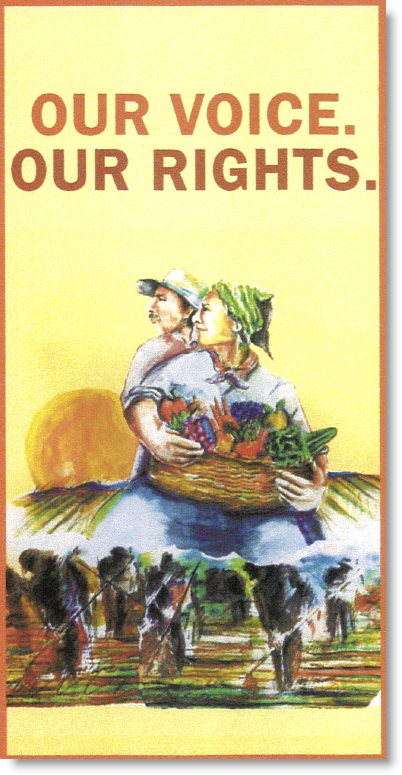 With the dozens of stories I’ve written about the bold fight of farm workers at Gerawan Farming against unionization by the United Farm Workers labor union, and the Agricultural Labor Relations Board, a couple of recent letters synopsized the shocking series of events. The attorney for the workers, Paul Bauer, penned two letters to ALRB Regional Director Silas Shawver, outlining events, and laying out a clear case for conflicts of interest by the attorneys at the ALRB. One of the most significant labor relations fights in the country is currently taking place in California’s Central Valley.The California state agency mandated by law to be an impartial farmworkers’ advocate between employers and unions is “in cahoots” with the United Farm Workers labor union. At issue are the legal tactics and scruples of the California Agricultural Labor Relations Board. A state superior court judge told an Agricultural Labor Relations Board attorney in 2013 that it appeared they were “in cahoots” with the United Farm Workers labor union. Even an independent investigation has confirmed that this is so. Despite a recent legal victory, thousands of California farm workers await another legal decision on the fate of their votes, by the state agency they petitioned to hold the election. The Agricultural Labor Relations Board is mandated to protect the rights of California farm workers. However, the ALRB instead waged a systematic campaign against thousands of farm workers in 2013 to prevent them from voting to de-certify the United Farm Workers union at Gerawan Farming, one of the nation’s largest family-owned fruit producers. Court documents, legal testimony, and sworn statements demonstrate a pattern of voter intimidation, harassment, last-minute rule changing, and other tactics to disenfranchise the Latino farm workers of Gerawan. Legal documents show that the ALRB general counsel and the Visalia-based regional director orchestrated a concerted effort to manipulate the votes of thousands of laborers at Gerawan Farming. UFW Inflates Membership Numbers – A Lie, or Premature Calculation? Posted by Katy Grimes at 4:54 pm on Apr 16, 2015 Comments Off on UFW Inflates Membership Numbers – A Lie, or Premature Calculation? The United Farm Workers labor union is either lying about how many members it really has, or is boastfully counting future farm worker members, while assuming it will win the fight over the workers. 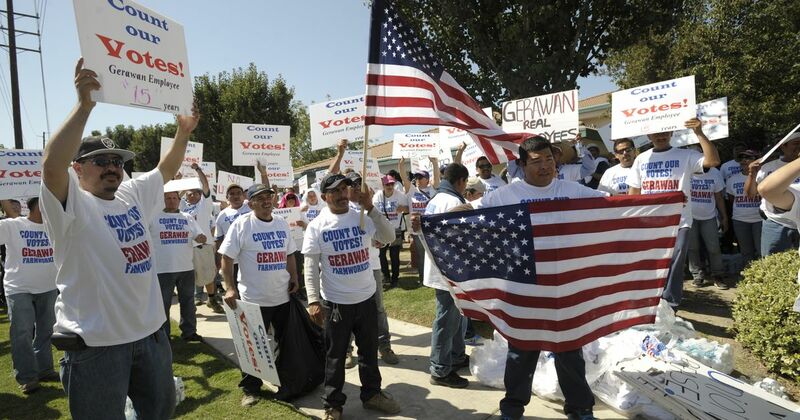 Gerawan Farming employees are under assault by the United Farm Workers labor union, the California Agricultural Labor Relations Board, and by Democratic politicians up and down the state. The workers don’t want to be members of the UFW, and held an election in 2013 to officially decertify the labor union. But the ALRB locked up the workers’ ballots, refused to count them, and has instead assisted the UFW in its takeover attempt. Gerawan Farming is a third-generation family farming operation, growing peaches and grapes in the Fresno area. The farming company is well known as a favored employer, and currently employees 5,000 workers. Gerawan has a history of paying the highest wages and compensation package in the industry, according to the many employees I’ve spoken with. As Wisconsin is set to become the 25th Right-to-Work state, California Gov. Jerry Brown is ignoring thousands of farm workers who don’t want to be unionized. In one of the most significant labor relations fights in the country proceedings have turned ugly, with many questioning the legal tactics and scruples of the Agricultural Labor Relations Board. The workers at Gerawan Farming have been trying since October 2012 to decertify the United Farm Workers labor union. The workers are not only being fought by the UFW union, Brown’s Agricultural Labor Relations Board has thwarted them at every turn. And pleas to the Democratic Governor and Legislature have fallen on deaf ears, despite their claims to care for farm workers. The only help the Gerawan workers have received is from state Assembly members Jim Patterson, R-Fresno, and Shannon Grove, R-Bakersfield.